wooooo! 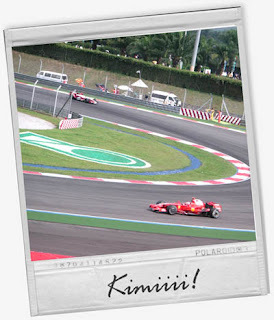 Kimi won! Ferrari won the 10th year F1 in Sepang! So cooool! We were hoping that Ferrari would finish first and second.. and then.. Massa's car spun and got stuck in the gravel. bleh. But that was fun, really. We missed the past two years (Dida was in Rotterdam.. then last year we didn't get tickets.. bleh.) but fortunately, our tickets were AWESOME this year AND Ferrari had won! Oh - so - happy! Totally makes up for those two missed races. 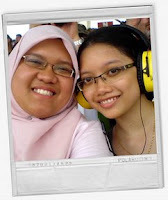 Dida had bought that huge head phone-radio thingy which she had basically gave me to wear throughout the race. Pretty cool stuff. I love being able to listen to the commentaries. Helps a whole lot with my sleepiness. Plus.. I actually do love listening to the commentaries. I'm a geek. I like knowing unnecessary stuff. haha. Anyway, we got home at 6-ish.. I was so tired.. the kind that got me a bit kooky and make stupid jokes all the way home. Uuh.. yeah.. that's Dida's SD card for the MP3 player in her car. hehe. Really.. 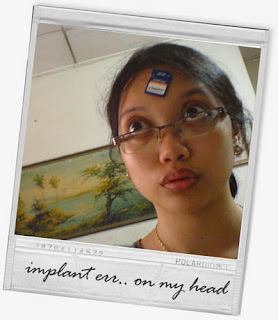 I like to experiment on things.. see what I can stick on my forehead. haha! Anyway, I'm going to rest a bit while catching the Super Sunday. MAN UNITED!!! wooo! O yeah, I am so ignoring my bitter mood by focusing on some sports. haha!